As part of Editing Robert Burns for the 21st Century we wanted to explore what Burns’s songs might have sounded like in his own day. 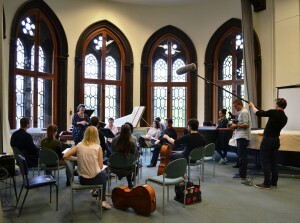 We brought together a group of young musicians to recreate domestic performances of Burns’s songs as they first appeared in the Scots Musical Museum and George Thomson’s Select Collection of Original Scottish Airs. Users of our Editing Robert Burns for the 21st Century Project website will know that our AHRC funding is underpinning the major research behind the delivery of volumes 1-5 of the new Oxford University Press Works of Robert Burns (ed. Gerard Carruthers). Vols. 2-5 will cover Burns’s work on two major song collections of the period, namely The Scots Musical Museum (ed. Murray Pittock) and the national song collections edited and published by George Thomson (ed. Kirsteen McCue). 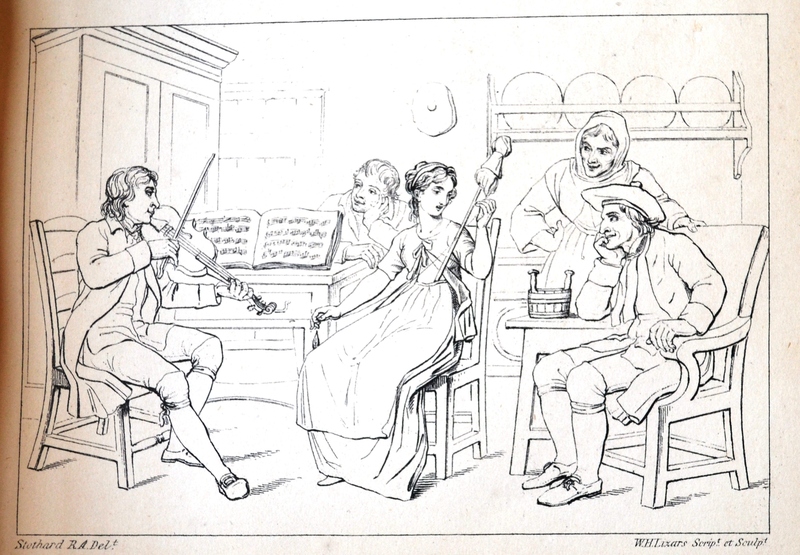 These two song collections (which included both texts and musical settings) appeared between 1787 and 1803, and 1793 and the late 1840s respectively. Both were created to compile comprehensive resources of Scots songs (and in the case of Thomson songs from Wales and Ireland too), but they were also designed for domestic music making. Learning instruments was a skill which was highly approved of and the arrival of the piano in Britain helped people make music at home. These two collections were intended precisely for this market. As part of the project we wanted to explore what this might have meant for the people buying these collections in Burns’s day. To this end we brought together a group of young singers and players in Glasgow to try and recreate a range of different domestic performances of songs from both collections. We did this across a number of workshops and completed the project performing the songs and recording them in the 18th century setting of Pollok House in Glasgow’s Pollok Park. But we wanted to find a range of players and singers at different stages in their careers – to create a mixed group akin to the average group of family and friends who would have been buying these volumes and attempting to perform them at home. We collaborated closely with staff at the Royal Conservatoire of Scotland (RCS). Head of Strings, David Watkin, was involved at the start of the project and recommended that we work directly with Ruth Slater, who coordinates period instrument performance at RCS, as well as being a lecturer in Creative and Contextual Studies there. Dr John Kitchen, specialist in Scottish keyboard music, came on board with his advice and practical expertise. With the help of period cellist, Alison McGillivray, we formed a team of two keyboard players (with experience of harpsichord and early piano), two violinists and two cellists (with experience of baroque instruments) and a guitarist who was also interested in early guitar. In order to recruit singers we began by collaborating with colleagues at the National Youth Choir of Scotland (Chief Exec Morag Campbell and Director Christopher Bell) and at the University of Glasgow (Director of the Chapel Choir, Katy Cooper). With their help we created a ‘Call for Singers’. In the end we brought together singers from both GU and NYCOS, and also from the RCS. This quartet of two sopranos, mezzo and baritone allowed a broad range of performance possibilities. 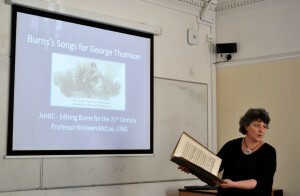 Some 25 songs from the Museum and Thomson’s collections were selected for performance – these were chosen to cover as broad a range of Burns’s songs as possible (from love songs to drinking songs and political anthems). The Museum settings were published with a melody line and bass line (and sometimes with additional figured bass to encourage harmonisations). These songs provided our performers with quite a lot of choice. They could mix and match different combinations of voices and instruments depending on how performers felt about the song in question. So, along with any combination of singers, they selected any combination of the harpsichord, violin, cello and sometimes fortepiano and early guitar. The keyboard players (and our guitarist) also had to decide how they wished to accompany the songs – making up their own harmonies as they went. Our violinist made decisions about playing ‘the tune’ along with the singer, or busking a different part to accompany the voice. The cellists could stick with the printed bass line or amend this by picking out key notes, or adding flourishes to their part. The musicians could decide if they wanted to create little introductions to each song, and whether to sing all the marked repeats. This freedom of choice meant that, in general, our performers enjoyed exploring the songs from the Museum more than they did the songs in Thomson’s collections. With Thomson’s songs there was a greater sense of fixed expectations, as the majority of these songs appeared for voice and piano with separately published parts for violin and violoncello. Moreover these settings most often include introductory and concluding ‘symphonies’ for the instrumentalists, before and after which the singer (with piano) performs the song itself. In the case of Thomson our performers felt much more obliged to stick to what they saw on the page. Any improvisation here was minimal, although they did make decisions about where they might include (or not include) Thomson’s ‘symphonies’ or whether they would perform all the marked repeats. 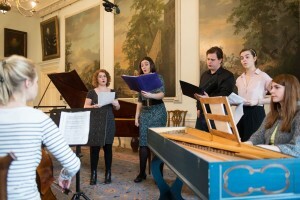 We selected as wide a range of different settings from Thomson’s collections as possible – from the first ones published in the 1790s and arranged or ‘set’ by Ignaz Pleyel and Leopold Koželuch (often accompanied by harpsichord) to some of the many settings by Joseph Haydn (more commonly accompanied by fortepiano). We also chose some settings by Ludwig van Beethoven and Carl Maria von Weber – from the 1810s and 1820s – which are notably more ‘Romantic’ in feel. And we recorded, for the first time ever, some of Thomson’s last musical settings of Burns’s texts by Johann Nepomuk Hummel. We also chose a few settings published in the 1820s and 1830s in Thomson’s six-volume octavo collection which were just for voice with fortepiano accompaniment. And we threw in Beethoven’s vocal trio setting of ‘Auld Lang Syne’ for fun….this appeared in the 1840s in Thomson’s last volume of Scottish songs, but the instrumental parts are impossible to find, so we just performed this with fortepiano. More information about the decisions we made are given in the notes to the individual songs where you can hear the final performances at Pollok House. As we’d hoped, we learned how these songs might have sounded to Burns and his contemporaries! We certainly had an insight into how those who bought the collections might have tackled playing and singing these songs. You can get a good idea about this from listening to each of the songs and reading the notes we have posted up beside the recordings. In the case of half of the songs we have video clips, several of which show the process of workshopping the song in question, and sometimes let you see a rehearsal of a song. The audio files will let you hear the final performance of each song. Our performers commented, during the process, on the forms of the publications. They agreed that it was often much easier to work with the printed copies from the Museum, as the songs were presented more simply. 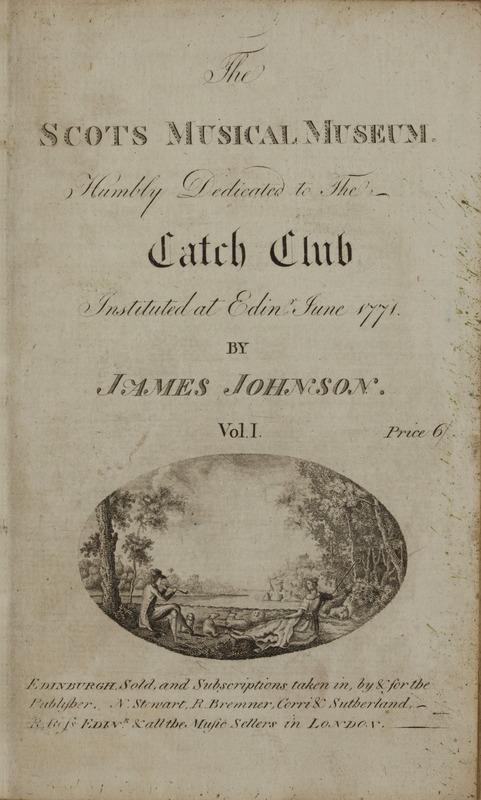 Thomson’s publications were, on the whole, much more complex and difficult to follow. 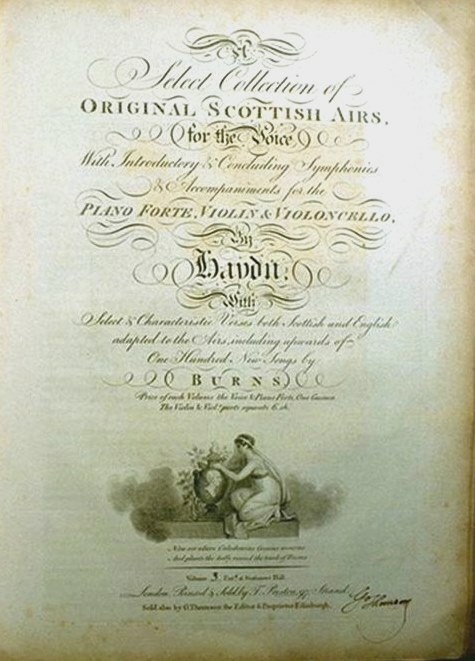 As the web resources and interviews reveal, there were a number of musical challenges to performing Burns’s songs in his own day – from singers having to get their voices around what were often fiddle tunes, to players coping with matching separate instrumental parts to the vocal/piano scores, which our singers and keyboard players were working from. On more than one occasion they had to amend one of Thomson’s printed violin or cello parts to make sense of them in ensemble. While there was a great deal of choice with the Museum songs, many of them were ‘high’ for singers, and, while our performers were reluctant to do this, it may have been advisable to transpose some of these songs to lower keys. Overall, what was made most clear is just how difficult some of these settings would have been for novice or amateur players. We were working with a group of young musicians who are all experienced readers of music and who have all had some level of professional training. Even then, some of these settings – notably those from Thomson’s collections – were difficult to pull off. 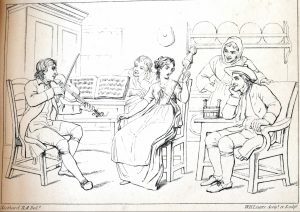 Without this kind of musical education, many of Thomson’s settings would have proved very tricky for the early 19th century amateur musician – if indeed they could manage them at all. It is little wonder that Thomson was often asking his composers to produce something simpler for the young ladies of Edinburgh to play! We have several people and institutions to thank for their support in making this project work! Firstly warm thanks to David Watkin, Head of Strings at the Royal Conservatoire of Scotland, who was most encouraging at the outset and who led us to Ruth Slater. Huge thanks to Ruth, who has worked closely with Kirsteen all the way through the project and with the string players and ensembles. Thanks to John Kitchen for working with our keyboard players – for his time, expertise and enthusiasm. And thanks to Allan Neave for his involvement regarding guitars. Many thanks to Katy Cooper at the Glasgow University Chapel Choir and to Morag Campbell and Christopher Bell at the National Youth Choir of Scotland. Warm thanks to Phil Hobbs at Linn Records for his early advice and his work to record all the songs in the back kitchen at Pollok house on some cold October evenings. Thanks also to Julia Thomas for editing all of the songs so that we could use them on the web resource. Nancy Braid and her team at Pollok House showed great interest in the project. They welcomed us and looked after us on the days at Pollok House, keeping the performers going with fine baking and hots cups of tea. Many thanks to all of those who helped at the National Trust for Scotland. Thanks to John Archer and especially to Dhivya Chetty, Emma Lennox and their team at Hopscotch films for filming the workshops and allowing us to use the footage from this for the web resource. Thanks also to Mike Trevett for editing the clips included on our website. At the University of Glasgow warm thanks to Anne Cumberland, University Concerts Administrator, for helping fix all the rehearsal rooms and sessions for our workshops and to Allan Wright for moving and tuning keyboards. 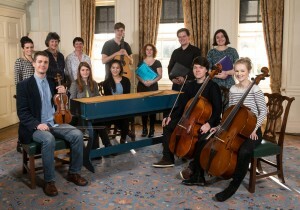 Warm thanks to Bill Zachs, for enabling us to share digital images from the Scots Musical Museum. Many thanks to University of St Andrews Special Collections for giving us permission to use their Scots Musical Museum score digitisations. Thanks also to Neil Miller for taking all those fantastic photos at Pollok House, and to Luca Guariento for helping edit audio files and for his music typesetting skills. Thanks to Brian Aitken for helping design the web resource to accommodate all the elements of our story. Last but not least, thanks to all of our performers – Gordon Abercrombie, Jennifer Falconer Hall, Alina Horvath, Jonathan Kennedy, Claire McBride, Daniel Mészöly, Nicholas Montgomery, Brianna Robertson-Kirkland, Beth Taylor and Tiffany Vong – who gave freely of their time and efforts to take part in the workshops and recordings. Without them, of course, the project wouldn’t have happened at all!